NEW! 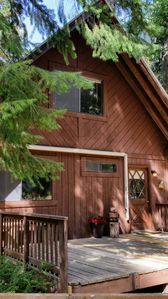 Secluded Leavenworth Cabin on Chiwawa River! 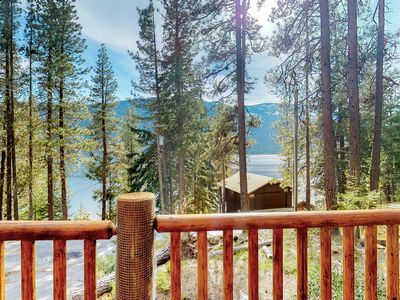 Looking to get away from it all? 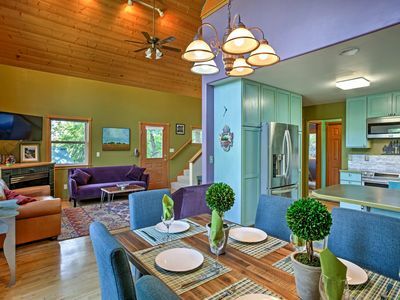 Then clear the calendar and head over to this 3-bedroom, 2-bath vacation rental cabin! 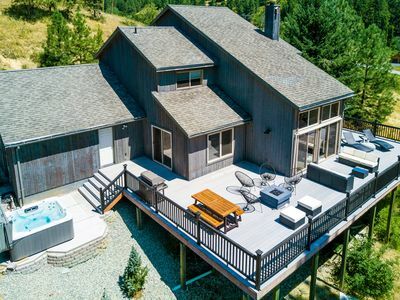 Hidden behind a half-acre of towering pine trees on a bluff overlooking Chiwawa River, this property is the perfect getaway for anyone wanting to get off the grid - without being too far from all the fun. 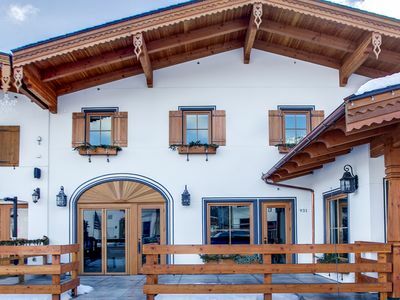 Bring 6 to 12 guests along for a vacation spent golfing, hiking, skiing, or taking part in one of the local holiday festivals. It's sure to be a getaway you'll never forget! Let the sounds of the river lull you into a worry-free mentality from the moment you arrive. 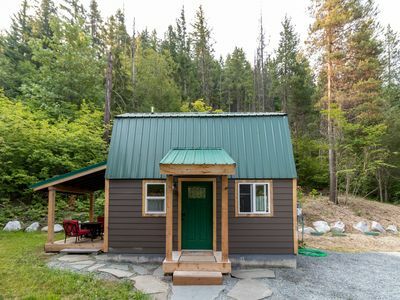 Located within the beautiful Okanogan-Wenatchee National Forest, this cabin offers forest views, peaceful surroundings, and one of the best spots on the Chiwawa waterfront. 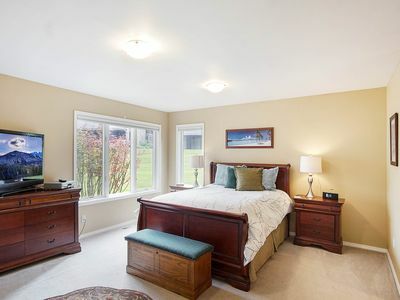 Make yourself at home inside the 1,662-square-foot interior. This ranch-style cabin stays true to an old world Cowboys and Indians theme - from the Native American artwork to the wood-carved rocking saddle bar stools! 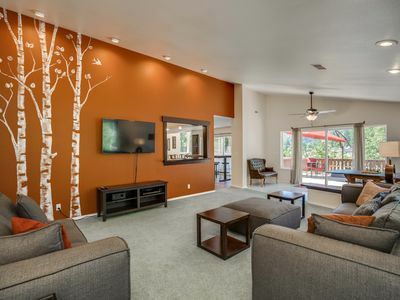 During the downtime, unwind in front of one of 3 flat-screen TVs, or simply enjoy a good book by the wood-burning fireplace in the living room. If you're looking for even more relaxation, retreat upstairs to soak in the master room's 2-person tub. Cooking for a crowd will be a breeze while you stay here. The kitchen is fully equipped with all the appliances necessary to assist with those home-cooked dishes. Follow dinner with a glass of vino and a view of the river from the wraparound deck - the perfect ending to another perfect day. 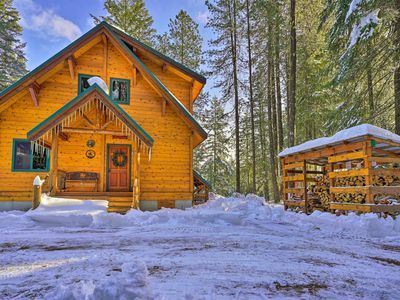 This property offers something fun to do, no matter the season! In the summertime, this half-acre plot is perfect for games with the family or kayaking down on the river just steps away. When winter rolls around, the area transforms into your very own sledding hill! Leavenworth is well-known as snowmobile heaven. 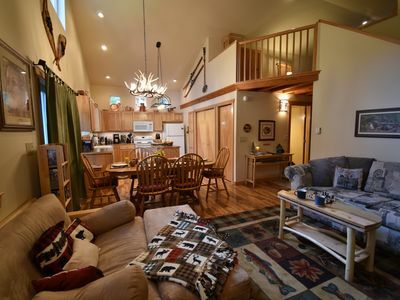 Rent or bring along your own to explore endless groomed snowmobile trails that begin right outside the door. 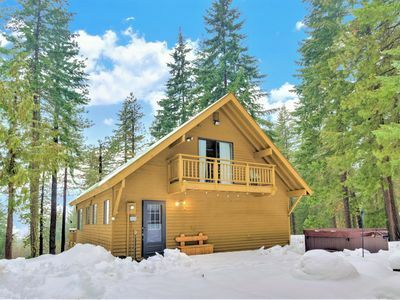 If you're looking for more winter activities, drive over to the quaint Kahler Glen Ski Resort or venture 30 minutes further to Stevens Pass Lodge. For bigger fish to catch, cast your line at Lake Wenatchee or rent a pontoon at Fish Lake - you just might be lucky enough to catch the famous monster German brown trout! Practice your swing and head to the greens! 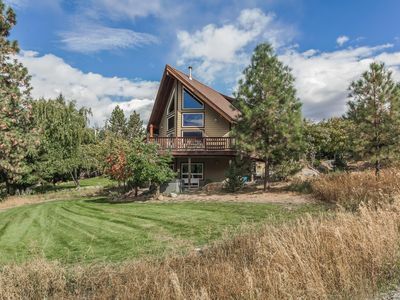 Within 30 minutes of the cabin, you'll find Kahler Glen Golf Course, Leavenworth Golf Club, and Mt Cashmere Golf Course. 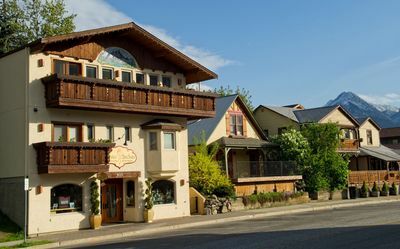 Check the calendar before you visit, Leavenworth hosts festivals and local events year-round, including the famous Christmas Tree Lighting and Oktoberfest! 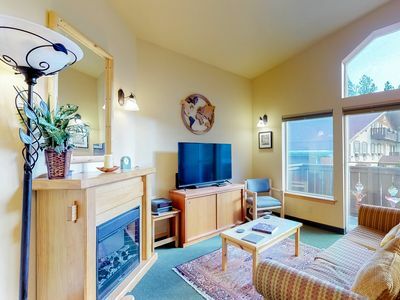 - Amenities include a fully equipped kitchen, free WiFi, 3 cable TVs, air conditioning, 2-person tub, wood-burning stove, waterfront view, covered balcony, wraparound deck, on-site parking, and more! Escape the hustle and bustle. Take time to relax and recharge! The Fox Lodge, nestled in the the Cascades. 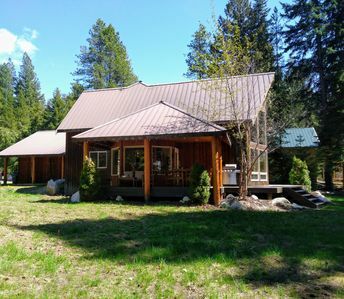 Tranquil Cabin on Beautiful Acreage, Hot Tub, Close to Leavenworth! Escape into Nature! 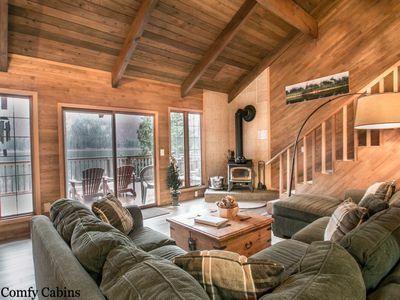 Wooded 3 Bedroom Cabin on Private 5 Acres. 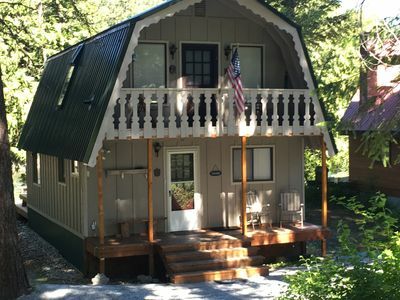 Sleeps 8, Dogs Welcome! 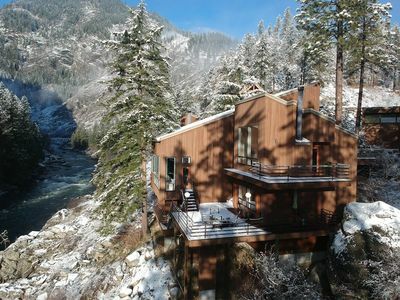 Alpine River House is an experience you will never forget! 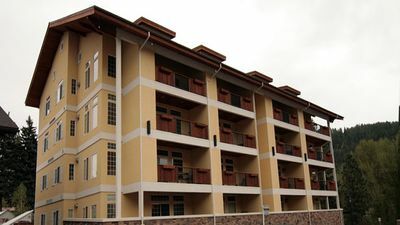 Grand View Suite: Elegant in Town Condo with Stunning Mountain Views! 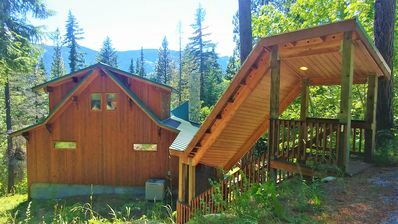 Leavenworth Chalet-Mountain Views and only 1 mile to Leavenworth! 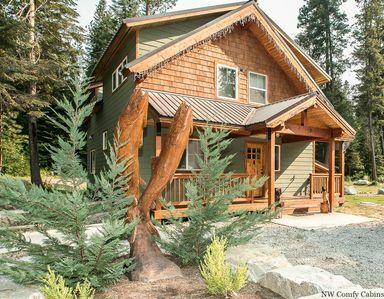 Serene Leavenworth Getaway with All the Amenities! Enjoy Peace, Quiet, Nature and VIEWS!